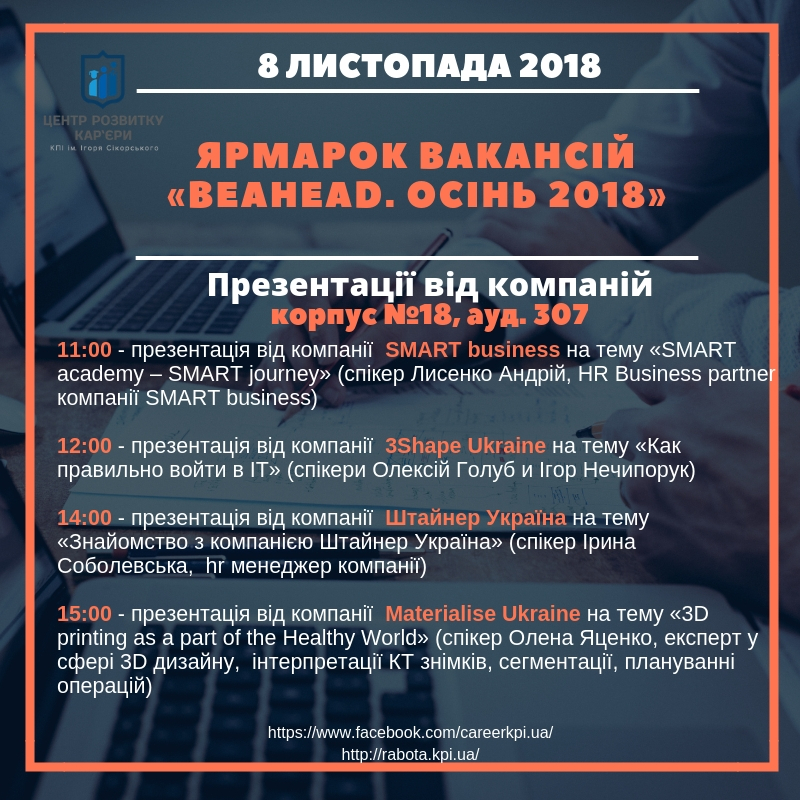 On November, 8 at Igor Sikorsky Kyiv Polytechnic Institute a regular fair of vacancies “beAhead. Fall 2018” was held. Its organizer has traditionally been the University Career Development Center. 44 companies took part in the fair, many of which systematically participate in such events. But there were also companies that first came with their stands to the KPI. As always, the main goal of the fair was to give the opportunity to the students and graduates of Igor Sikorsky KPI and other institutions of higher education of getting acquainted with the activities of companies, enterprises and organizations looking for new employees. So, the representatives of "NIK-ELECTRONICS" Ltd., "STUDIO 1 + 1", 3Shape, British American Tobacco Ukraine, Dentsu Aegis Network Ukraine, Innowarer, LLC "Costaal Ukraine", KPMG, Alpha, told the numerous visitors. -Bank Ukraine, Steiner Ukraine, Wed, LEXX International, Belo Tserkva Plant Tribo, SMART business, Genesis, EVO, SoftServe, LLC "Distortion-Kyiv", MEDoc, PepsiCo, BRSM, Xpand Ukraine, Faros Production, Materialise Ukraine, Intetics, LLC "Vent-Service", GlobalLogic, PJSC "Ventilation systems" and others spoke about vacancies and open programs. Students and graduates also had an opportunity to see presentations from 3Shape, Steiner Ukraine, Materialise Ukraine and SMART business. It should be noted that during the event in the hall of the building number 18, where the fair was held, there was no free place. This is a vivid indication that this event generates a significant interest from both employers and students on a yearly basis. We should mention the positive feedbacks of the HR managers of a number of partner companies regarding the high level of professionalism and creative approaches of graduates of the KPI to solve their tasks.